Where censuses are concerned, politics and ideology are pervasive. The 2011 census in Scotland (a semi-autonomous part of the United Kingdom) was the first to ask a question about Scots, a close relative of English, which is historically the vernacular in many parts of Scotland. While at one time Scots had high status as the national language of Scotland, it is now widely regarded as a ‘dialect’ of English, and for many people it has associations of inferiority. At the same time, it has political relevance because of its potential to be an important cultural marker for an autonomous Scotland. The policy position of the current Scottish government, which advocates independence, is to protect and celebrate Scots. Adding a question about Scots to the census was an attempt to advance this by finding out who and where the users of Scots are. Research carried out before the census had shown that the public had differing ideas about what could be called Scots and whether it was, in fact, a different language from English: according to one previous survey, 64% did not think of it as a language at all. Given this background it is unsurprising that interpretations of the census results were controversial, reflecting to some degree existing language ideologies. According to some, the census provided no useful information, while according to others it demonstrated that there was a robust Scots-speaking population and a clear public understanding of what it meant to be a speaker of Scots. This paper discusses the history and political background to the problematic language questions in the Scottish census, and how the choice of questions, their wording and even their order on the questionnaire may have affected the results. Despite the flawed questions and many difficulties of interpretation, it seems that the 2011 census, whether or not it succeeded in enumerating accurately the speakers of Scots, may nevertheless have helped to raise public awareness of the language and to legitimise it. There are lessons to be learnt from the Scottish census, too, in other situations around the world where there are unclear boundaries between ‘language’ and ‘dialect,’ or where low-status and high-status varieties of ‘the same’ language coexist. What is the difference between a language and a dialect? This question, as sociolinguists are well aware, is not one which can be answered by linguistics alone: it is largely a matter of history and belief, of politics and ideology. Yet the answer might have consequences for counting speakers in a census. National censuses, far from being neutral exercises in enumeration, are always pervaded by ideology and politics. In particular, where questions are asked which relate to personal identities—for example, race, ethnicity, religion, nationality or national identity—both the question posed, and the answer given, are likely to be ideologically charged (see e.g. Urla 1993; Cohn 1987; Kertzer and Arel 2002; Leeman 2004; Sebba 2017a, b; Duchêne et al. 2018). This paper looks at how the ‘language and dialect’ question has played out in the context of one national census—that of Scotland, a partly autonomous country of the United Kingdom, where questions of national identity have particular salience. While an independent cultural identity for Scotland has long been an established fact, the role of language in that identity has been somewhat ambiguous. Scotland has two good candidates for languages which make it culturally distinctive from all other countries. One of these is Scottish Gaelic, a Celtic language once predominant in Scotland, but now spoken mainly in the Scottish Highlands and Western Isles. The second is Scots, a close relative of English. Scots provides a classic example of the difficulty of distinguishing between a ‘dialect’ and a ‘language’. Whether it is considered a separate language, or a dialect of English, depends on a mixture of factors, linguistic, historical, and—especially-social. In terminology suggested by Kloss (1986: 73), it is a ‘kin tongue’ of English, ‘clearly and recognisably akin to the […] nationally dominant language’. Scotland in the late sixteenth century was an independent state in which Scots functioned as an administrative and literary language, as well as the vernacular of a large part of the population. Despite that, Scots is now largely viewed as a dialect of English, and has been for the last three centuries (see Section 2). Given the complexity and uncertainty surrounding this issue, it is not surprising that the decision to include detailed language questions in the 2011 national census in Scotland, including one about Scots, was controversial. Nor is it surprising that there were problems formulating the questions, and interpreting the responses. These problematic issues are the topic of this paper, which is organised as follows. We begin with a brief description of Scots and its history, outlining the origins of the blurred dividing line between ‘English’ and ‘Scots’. Section 3 discusses the recent politics of Scots in the changing political landscape of Scotland leading up to the 2011 census. Section 4 gives the historical background to census questions on language in Scotland, and the decision to ask specifically about Scots in 2011. Section 5 gives more detail and a critique of the three census questions on language. Section 6 discusses the census findings and their reception. While there was considerable disagreement about what the statistics actually meant, one conclusion that may be drawn is that respondents’ interpretation of the language questions is influenced both by the circumstances of the language asked about (such as its position in the sociolinguistic hierarchy) and by the discourse of the questionnaire document itself. The fact of mentioning other languages by name, and the ordering of questions and arrangement on the page are all potentially relevant. Section 7 returns to the question of the ideological and political nature of censuses, and the relevance of the ‘language or dialect’ question elsewhere. It concludes that while it remains unclear how many people speak Scots, or even whether that question can be answered, the 2011 census nevertheless helped Scots to gain legitimacy as a language. Macafee and Aitken (2002) point out that ‘some of the most prominent scholars of the Scots language […] refrained from claiming language status for Lowland Scots’ while others ‘have made the case for considering Scots to be a minority European language’. Scots is a West Germanic language which originates from the language of the Angles who settled what is now lowland Scotland and the north-East of England; thus it is a close relative of English, which is more influenced by southerly varieties of the Anglo-Saxon language. The history of Scots is complex and has been the subject of extensive research over a long period. For a detailed overview, readers are referred to Corbett et al. (2003), Macafee and Aitken (2002)1 and numerous references cited there. Both Scots and English are the products of substantial language contact, and differences between them are to some extent the result of contacts of different intensity at different stages (Corbett et al. 2003 : 4–5). In the case of Scots, there have been influences from Gaelic, Old Norse and French, but recent scholarship has established that the most important sources are two closely related languages: the Northumbrian variety of Anglo-Saxon, which was brought by settlers from the early seventh century, and Anglo-Danish, the vernacular of the part of England under Viking control, which was introduced from the south several centuries later (Aitken 1985: ix). From the late fourteenth century Scots began to develop its own literature, and to supersede French (in courtly and chivalric writing) and Latin (in administrative and legal functions). Acts of Parliament were recorded in Scots from 1390. Texts from that period show little difference between the language varieties in Scotland and those of the north of England, though by the mid-fifteenth century Scots was developing distinctive Scottish norms. ‘Scots clearly had attained pre-eminent status in lowland Scotland’ by the early fifteenth century, and a period of consolidation followed (Corbett et al. 2003: 8). ‘The years 1460—1560 can be considered the heyday of the Scots tongue as a full national language showing all the signs of a rapidly developing all-purpose speech, as distinct from English as Portuguese from Spanish […]’ (Murison 1979: 9). However, this language was ‘in speech and writing, far from a single homogenous language variety’ (Corbett et al. 2003: 10). Despite being prestigious and elaborated to fulfil a large range of functions, Scots was still highly variable and subject to influences from (southern) English, with the tension between Scottish and English norms leading to increased variation (Corbett et al. 2003: 10). From the sixteenth century onwards, with social influences from England increasing, the language of Scotland began to lose status compared to its southern neighbour. Scots began to show convergence towards the developing English standard. The fact that written English and Scots were mutually intelligible meant that English printed texts could be read in Scotland. English printers were far more prolific than those in Scotland, while some Scottish presses shifted towards the English norms. Furthermore, important religious texts, including the Bible, were in English rather than Scots (Corbett et al. 2003: 11, Macafee and Aitken 2002, 2.5.2). When the Scottish king, James VI, succeeded to the throne of England in 1603 and moved his court to London, the fortunes of Scots, already waning, declined further. By the end of that century, ‘most texts in Scotland were written after the English fashion’ (Corbett et al. 2003: 11). The Anglicisation of the spoken language lagged behind that of the written language, but from the seventeenth century onward, the Scottish upper classes began to have more personal experience of England, with many spending time there, and some intermarrying. These individuals were able to spread the English speech norms within Scotland, leading to a situation where ‘by about 1760, it was distinctly quaint for a gentleman or lady to speak Scots in polite company’ (Macafee and Aitken 2002, 2.5.2). The social status of Scots declined throughout society. Avoidance of ‘Scotticisms’, in speech as well as writing, spread gradually from the upper to the lower social classes. Scots became stigmatised and associated with ‘bad’ English and poor education. Following the 1872 Education Act, English became established as the language of schooling, and it became common practice to punish the use of Scots at school. Unger’s present-day focus group participants, middle aged and older, ‘make numerous references and allusions to corporal punishment in relation to using Scots’ (Unger 2010: 130), showing that Scots as a source of stigma is still part of the lived experience of many Scottish people. Despite the decline in status of spoken Scots, after the political union of England and Scotland in 1707 there was a revival of distinctively Scots literary writing. The national poet of Scotland, Robert Burns, belongs to this era. However, the readers of this literature were used to English norms of spelling, and writers tended to follow them, with adaptations to signal Scottish differences. This gave Scots the appearance of ‘a divergent and inferior form of English’ (Corbett et al. 2003: 12-14). From the 1920s onwards, a ‘Scottish Renaissance’ took place in art and literature, with a key role played by the writer Hugh MacDiarmid, who attempted to use Scots to ‘create a literature […] that would be capable of tackling the range of topics and genres that had been available to Scottish poets in the Middle Scots period’ (Corbett et al. 2003: 14). Scots can thus be seen to have gone through a number of phases in terms of its independence as a language: an early stage up to around 1450 where it was simply a northern form of English, followed by a period in the fifteenth and sixteenth centuries during which it developed an independent set of norms and elaborated functions. By the mid-sixteenth century it had begun a decline into ‘dialecthood’, becoming the ambiguous object either of disdain, as in the case of working-class urban varieties, or sentimental affection, for the language of writers like Robert Burns. Douglas (2009: 35–36) draws attention to differences of practice and attitude among the Scottish middle and working classes. She observes that ‘it is a very curious anomaly that those individuals who speak Scots are generally unable to write it and/or read it; those who are most likely to be able to read and perhaps even write it are usually well-educated middle-class non-Scots-speaking individuals.’ At the same time, she says (Douglas 2009: 45), it is ‘considered quite acceptable, indeed in certain contexts desirable, for educated middle-class Scots to use a smattering of Scots lexis and idiom […] as a way of claiming linguistic kinship with their fellow Scots’. Using Scots in speech and writing fulfils an emblematic role, she suggests, for middle class Scots whose educated Scottish accent and facility with Standard English provide a ‘safety net’ to differentiate their usage from working-class speech. Among the working class, she suggests, speaking ‘good English’ is recognised as a way to ‘get on in life’ but can also be seen as ‘pretentious, betraying your roots, and, worst of all, as aping the English’. Hence ‘there is covert prestige associated with working-class Scottish speech’. Perceptions of the separateness of Scots from English have been ambiguous throughout history. As Macafee and Aitken write (2002, 2.5.2), ‘Scots and English have never been isolated from each other, and have always formed a geographical continuum of dialects within which linguistic changes diffused and spread’. In the earlier stages, ‘Inglis’ was used in Scotland to refer to both Scots and English, distinguishing it from Gaelic. The name Scottis for Scots came into use only by the late Fifteenth or early Sixteenth Century (Corbett et al. 2003: 8), and even after this, there was a ‘predominant contemporary perception that Scots and English were the same language’ (Macafee and Aitken 2002, 2.5.2). This lack of differentiation is reproduced in different areas of contemporary discourse about Scots: linguistic, governmental and popular. In their ‘Brief history of Scots’2, Corbett et al. (2003: 2) describe Scots as ‘a language continuum ranging from Broad Scots to Scottish Standard English.’ However, they say, because written Scottish Standard English (SSE) is relatively similar to other written standard varieties of English, ‘some therefore prefer to exclude [SSE] from their definition of Scots, and focus on the more distinctive “Broad Scots” end of the continuum’. Even this ‘ignores substantial complexities [as] “Broad Scots” refers not to a single linguistic entity, but to overlapping regional and social language varieties, most of which are declining or transforming, generation on generation’ (Corbett et al. 2003: 2). While written SSE has relatively little to distinguish it from other written Standard Englishes, it has a distinctive pronunciation. From the end of the eighteenth century the Scottish upper and middle classes sought to distance their speech from Broad Scots, while retaining certain of its features (Corbett et al. 2003: 13). The result is that spoken SSE shares with Scots many features which distinguish both from English varieties used in England (Maguire 2012: 56–58). Although the continuum model is widely used, Maguire (2012: 55) points out that it is rather unrealistic and ‘it is more enlightening to think of Scottish speakers, like speakers everywhere else, as operating in a multi-dimensional sociolinguistic variation space’. It is clear that ‘separateness’ is only partly a question of linguistic distinctiveness. It is equally a question of how the varieties are perceived by speakers (and to some extent, non-speakers). It is perfectly possible for similar varieties, close to each other on a dialect continuum, to be perceived as distinct entities, even where differences are relatively small: for example Castilian and Galician, German and Swiss German (cf. Gumperz 1982: 20). Specific differences may become emblematic of the varieties and take on symbolic importance as boundary markers. For speakers of these varieties, identifying what they speak (irrespective of whether it is a ‘language’ or a ‘dialect’) is relatively unproblematic, because of a clearly perceived border. This is not the case for Scots. Official discourse likewise demonstrates no widely accepted dividing line between English and Scots. Unger (2013: 149–150) notes that in the curriculum guidelines, policy documents and parliamentary debate which provided his data, ‘under-specification and vagueness of definition and reference allowed many potential interpretations of what Scots should be defined as, and in turn also of what constitutes Scots (in other words, whether a given utterance might be regarded as Scots or not)’. Nor does the general public seem to have a perception of a clear boundary between English and Scots. Following an election manifesto commitment to ‘promote awareness and usage of the Scots language’, the Scottish Government commissioned survey research in 2009 to help inform policy development for Scots by providing ‘a broad overview of perceptions of the Scots language and attitudes towards it’ (Scottish Government 2010a: 1). This showed that 64% agreed with the statement ‘I don’t really think of Scots as a language—it’s more just a way of speaking,’ though 29% disagreed with this. At the same time 67% agreed that ‘I probably do use Scots, but am not really aware of it’ (2010b: 2). The status of the continuum which (according to some at least) links ‘Scottish English’ and ‘Scots’, and the intermediate varieties on that continuum. These issues constitute problems for any proposed census question about Scots. If people do not regard Scots as a language, are uncertain about what it is, or are unaware of using it, it will be difficult to get reliable answers by asking about it by name. This will only be made worse if similar questions are being asked about other named varieties which clearly are perceived to be distinct languages, namely Gaelic and English. Furthermore, if Scots once was, and perhaps still is stigmatised for some Scottish people, they may be reluctant to call themselves speakers, especially if they have more prestigious options (English in this case) to choose from. Contemporary public attitudes towards Scots seem to be mixed. The results of the 2009 survey (Scottish Government 2010a) suggest that around a half to two-thirds of the population value Scots highly and feel that it does not sound unpleasant, that it has educational benefits, and that children should be encouraged to speak it. Eighty to ninety per cent of respondents thought that Scots played an important part in history, heritage and cultural identity (2010b: 22). On the other hand around a quarter to one-third of the population appear to have more negative views of Scots (2010b: 2–3). Reflecting this, Unger observes that among focus groups, ‘Scots is continually juxtaposed with the perceived ‘standard’, i.e. English, and is often constructed as deficient in some way (even as it is ‘celebrated’ in other ways)’ (Unger 2013: 153). In the 1970s, language activism in support of Scots began to emerge, with the establishment of organisations to promote the image and use of Scots (Glen 2010: 50) mainly through corpus development—literary journals, a dictionary and the New Testament in Scots. By the 1990s, there was some provision for Scots in the school curriculum, and Scots received recognition as a minority European Language under the European Charter for Regional or Minority Languages. While that recognition could have been decisive, according to Eagle (2011: 258), government policy towards Scots since then ‘has been incoherent, poorly assembled and implemented in a half-hearted and contradictory manner’, and Millar (2006: 82) observes that ‘Scots appears to be perceived essentially as an addendum to Gaelic by the Scottish authorities’. Scottish political parties were slow to develop policies on Scots: the Scottish National Party (SNP) was first, in 1996 (Glen 2010: 50). Since 2007 the SNP has been in power in Scotland, and current policy of the Scottish Government is that ‘we have a duty to protect this indigenous language and celebrate its contribution to Scotland’s identity and future’.3 As part of this it ‘will promote and support Scots and encourage its respect and recognition in order that what for many is the language of the home can be used in other areas of Scottish life’. Actual achievements by the SNP government include the appointment of a Ministerial Advisory Group on Scots and the development of a Scots Language Ambassadors scheme, in which Scots speakers go into schools to promote the appreciation and use of Scots (see http://www.scotslanguage.com/articles/view/id/4396). Glen points out that reactions to the 2009 survey mentioned above (Scottish Government 2010a) ‘illustrate how language policy in Scotland has become increasingly politicized,’ with the SNP claiming the results show the importance of Scots in the everyday life of modern Scotland, while other parties are far less enthusiastic (Glen 2010: 55). She believes (2010: 56–57) that those parties which seek to maintain the union with England ‘will continue to press the idea that Scots is merely a dialect of English’ while the SNP, which favours independence, ‘will endeavour to raise the status of Scots as a language’. This seems to be reflected in the party manifestos for the 2011 and 2016 Scottish Parliament elections4: among the main parties, only the SNP makes a clear commitment to provide support for Scots; the Scottish Labour Party mentions Scots but only makes a commitment to Gaelic, while the other main parties make no reference to Scots. Although the Scottish National Party is committed to supporting Scots, steps towards this have been modest in the eyes of many observers. Millar (2006: 83), (writing before the SNP took control of the Scottish government), concludes that Scots is viewed as problematic by legislators both because of their own language attitudes and a view that ‘United Kingdom institutions do not willingly enter language policy and planning debates’ except when pressed by a ‘large, active and effective language movement demanding change’. While this was present for Welsh, it is not for Scots. At this stage, it seems that the political stakes in promoting Scots as a language are quite limited. It is not at the centre of a powerful cultural or linguistic movement, and indeed is viewed quite negatively by a substantial part of the population. Glen (2010: 57) concludes that Scots ‘may yet become a valuable symbol that can be mobilized in the task of building an independent nation state’ but the evidence suggests that this is at present some way off, and will require considerable mobilisation. However, the 2009 survey shows that there are many individuals who are positive about Scots, and Scots has strong advocates especially among writers, educators and politicians. Unlike England, where language questions were a novelty in the 2011 census, Scotland has had a census question on language since 1881. This question was introduced at the prompting of activists concerned with maintaining and promoting Gaelic (Mackinnon 1990), and asked only about Gaelic. The question developed over time, with the addition of questions about literacy (in 1971) and understanding (in 2001), so that the 2001 household questionnaire asked ‘Can you understand, speak, read, or write Scottish Gaelic? [Tick] all the boxes that apply’. Until 2001, this was the only language question in the census in Scotland. It provided language activists and educators with valuable information which could be used to develop policies (see, e.g. Mackinnon 1990). The lack of a census question about Scots, and the consequent lack of data about Scots in comparison with Gaelic, had been an issue for activists for some time (Leith 1997: 133). In the 1990s the first serious attempts to determine the number of Scots speakers were made. Steve Murdoch, now Professor of History at St Andrews University, carried out the first countrywide survey of Scots, with volunteer fieldworkers and 450 participants (Murdoch 1995). According to Macafee (2000: 11), Murdoch’s survey ‘provided optimal conditions for allowing Scots speakers to identify themselves as such,’ giving an estimated weighted average of 53% of the population who would answer ‘yes’ to the question ‘Can you speak Scots?’. From the early 1990s onwards, Scots language activists presented a case to the relevant authorities for a question on Scots language to be included in the 2001 UK Census. Macafee (1996), on behalf of a range of cultural and academic organisations concerned with Scots, argued that a census question would be useful for language policy development, planning for educational provision, cultural development and cultural tourism, monitoring the effectiveness of financial support for the language, development of language industries, academic research, and the promotion of Scotland abroad. The General Register Office for Scotland (GROS), the census authority, in 1996 convened a ‘Scots Language Census Question Forum’ where advocates for Scots put forward arguments in favour of a language question. These included the value of detailed statistics for designing interventions to promote the language and reverse its decline (as had already been done for Gaelic), and for monitoring the effects of policy changes. With a question on the lines of ‘Can you speak Scots’, Scots speakers identify themselves correctly, but many within peripheral/mixed speech groups, problematic to define as sharply as the words suggest […] would also identify themselves as Scots language or dialect speakers. Some English speakers who were in day-to-day contact with Scots language or dialect speakers would also say they spoke Scots […]. That these issues were seen as problems highlights how for the enumerators, the priority was to quantify the members of an objectively defined category of ‘Scots speakers’. In other words, the aim was to count people who—by some objective definition—could speak Scots, rather than to count those who believed they spoke Scots or self-identified as Scots speakers. Yet the census methodology of self-enumeration made this goal unrealistic, as respondents did not perceive a clear dividing line between Scots and English. Neither is there an agreed and objective definition of ‘Scots’. As in the case of the GROS study a decade before, the researchers identified ‘a problem’, in that responses would not be consistent, and hence would yield no ‘meaningful data’ on Scots. Again, the enumerative goal was to have a clear division into two categories, ‘Scots speakers’ and ‘non-speakers of Scots’. But this classification does not match the understanding of the respondents. Many people were not clear about ‘Scots’ meant in the census context. In the 2009 census test ‘there were more spontaneous questions about the term Scots than about any other terms or questions in the Census’ (Eunson and Murray 2009: 9). Furthermore, some respondents did not take the question seriously: ‘there were more comments that it was a “stupid question” than any other question’ (Eunson and Murray 2009: 10). This is likely to have been why the GROS originally decided not to propose a question about Scots in the 2011 census. According to the Scots Language Centre, which was a strong advocate of including a question, ‘Concerns arose during 2009 that Scots would be excluded from the Census and as a result a number of organisations and individuals stepped up the campaign for the language’s inclusion’. In response, the minister responsible ‘asked the Scots Language Centre and General Register Office for Scotland to work together on the matter’ (Scots Language Centre 2010). During Parliamentary committee discussions in 2010, the Registrar General for Scotland stated that ‘We have agonised about the language question, which is probably one of the issues on which we have spent most time. […] We have changed the questions a bit since 2009 in order to try to capture more about the Scots language and we have tested those revised questions very carefully indeed, because we were worried that they would not be easy to answer. The results of the tests give us no concerns at all’ (Scottish Government 2010b, Cols. 3300–3302). The committee approved a census questionnaire including three questions about language, one of which explicitly referred to Scots. In February 2011, three months before the census, the Scottish Government announced the launch of a website ‘to help people in Scotland answer a question in the 2011 Census about language ability […] The Aye Can7 website contains information to help people decide if they use the language, including examples of written and spoken Scots.’ The culture minister described it as ‘a fabulous tool which explains exactly what is meant by the Scots language and will help people decide how to answer the census question’ (Newsnet Scotland, 2011, quoted by Unger 2013: 146). The site offered a selection of audio clips of Scots speakers from around the country and advised users that ‘listening to people on this site speaking Scots can help you decide whether or not you are a Scots speaker’.8 According to Unger (2013: 146–147), there were criticisms that ‘some of the voices featured were not broad Scots speakers’ which may have caused some non-speakers of Scots to believe that they were Scots speakers. This again underlines the subjective nature of judgements about the dividing line between ‘Scots’ and ‘English’. Thus preparations for the census now involved educating the public in readiness for answering the language question, in the hope of getting consistency in the answers and avoiding the outcome foreseen by Eunson and Murray (2009: 12) that ‘the question will not yield any meaningful data on Scots’. 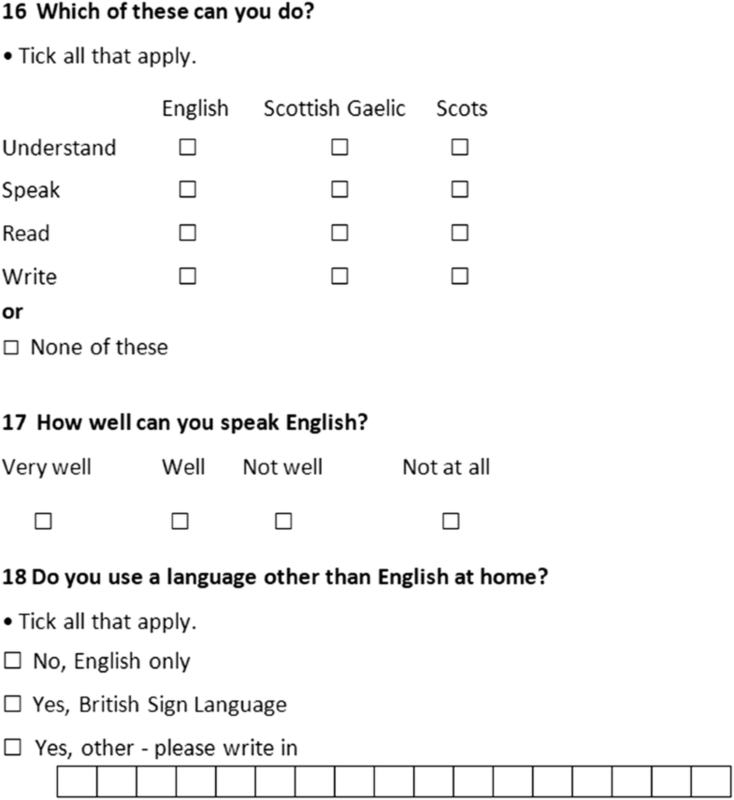 The 2011 census questionnaire contained three language questions: one specifically about abilities in English, Gaelic and Scots, one about knowledge of English, and one about home language (Figure 1). There are problems associated with each of these questions. We discuss them here in turn. The first language question (Q16) was a re-working of the old question on skills in Gaelic, but with two important additions: this question used a matrix to ask about the ‘four skills’ in English and Scots as well. The use of a matrix could be problematic in itself. In England, the Office for National Statistics had experimented with using a matrix for its own census language question and rejected the idea: ‘international research and best practice also advises that a matrix format is not appropriate for a question in a self-complete census questionnaire [… such] questions are known to be difficult to understand and interpret for people with poor comprehension skills or English as a second language’ (ONS 2009: 27). One advantage of using a matrix was that it made clear that this was not an either/or question. Thus, it would be possible to tick the boxes in the columns for both Scots and English, or all three. However, given that public perceptions of what counted as ‘Scots’ were unclear, putting the unstandardised, unclearly defined ‘Scots’ directly alongside the standardised, and clearly distinct, English and Gaelic, could have caused confusion. The wording of the second language question, ‘How well can you speak English?’ is identical to that used in the census for England, and is based on a question used in the US census (ONS 2009: 31).This question requires the respondent to self-assess proficiency in English on a four-point scale: ‘very well,’ ‘well,’ ‘not well,’ ‘not at all’. Recent research, e.g. Edele et al. 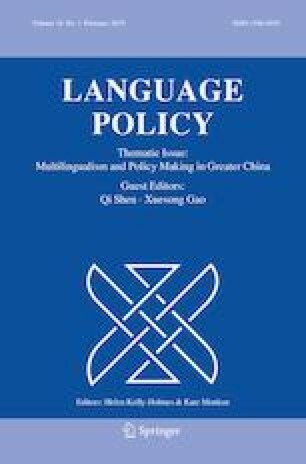 (2015) casts doubt on the reliability of self-assessment data on language provided by second language speakers, while the arbitrariness of the four categories and the normative mindset required to answer the question have also attracted criticism from linguists (see Zentella et al. 2007; Sebba 2017b; Leeman 2018). On these grounds if no others, this question could be considered problematic. The question was included as a response to requests from data users across the UK to have information about the extent of knowledge of English among linguistic minorities. The process which led to the choice of wording used in England has been documented by the ONS (2009: 38-40) and it is likely that the identical question was adopted for the Scottish census for similar reasons. Although this question was the same as one asked in the census in England and similar to that in the USA, its context was very different in the Scottish census. As Question 16 asked about four separate skills in English, Scots and Gaelic, Q17 might be interpreted as asking specifically about speaking English. Furthermore, in England, the previous question was simply ‘What is your main language?’ and respondents who said that their main language was English were directed to skip the question about knowledge of English. In Scotland, Q17 was asked of all respondents, creating the potential for some who spoke English as a first language to answer that they nonetheless spoke it less than ‘very well’. This seems to have been intentional. In the Scottish Parliament committee discussion9, it was recorded that this question ‘is identical to that in the England and Wales census—but is for everybody to answer, because it is important to identify English speaking ability for those who are native speakers, because of concern about the fluency of English among the entire population’. Census tests in England showed that some respondents who declared their ‘main language’ to be English would nevertheless rate their English proficiency as less than ‘very good’ if asked, and that this was at least in part due to negative value judgements about nonstandard speech.10 Therefore in the English census, because first language speakers of English ‘might interpret the proficiency question as a measure of social class’ they were instructed to skip this question (ONS 2009: 40). The last of the language questions (Q18) asked whether the respondent used ‘a language other than English at home’ with the opportunity to tick a box for ‘No, English only’ or ‘Yes, British Sign Language’ or to write in the name of one other language. The ‘home language’ question was the Scottish counterpart to the question asked In England and elsewhere: ‘What is your main language?’. There is no indication of why the Scottish census authorities decided to ask about ‘home language’ while the Office for National Statistics, after testing several alternatives, opted to ask about ‘main language’ in England and Wales (ONS 2009, Sebba 2017b). However, the first set of recommended questions for Scotland (GROS 2008) mentioned only English and Gaelic in the ‘language skills’ question, and the ‘home language’ question would have provided an opportunity for Scots speakers to mention Scots: ‘a third question will collect information on use of languages other than English at home, including the Scots language’ (GROS 2008: 37). According to the same document, ‘Strong user need was identified to GROS for information on other languages […] Many possible uses have been identified for the additional information which would be available for various languages’. This question also could be seen as problematic. As pointed out by McLeod (2013), if it is taken literally as asking about languages used in the home, someone who uses Gaelic occasionally with visitors could answer ‘yes’, even if they use English with their own family the rest of the time. The occasional user of Gaelic would not be differentiated from one who uses exclusively Gaelic at home. Apart from this, it is clear that the question privileges English: any language that is not English or British Sign Language is here literally ‘other’. Speakers of all other languages used at home must write in the name of one, and only one, language. This would include not only the relatively small numbers of speakers of minority languages like Gaelic and Polish, but also most of the previously estimated 30% of the population who might declare themselves as speakers of Scots (since if Scots was used anywhere, it was likely to be in people’s homes). Here again was potential for misunderstanding when completing the form: as Scots had already been assessed in Question 16, should it be mentioned again in response to Question 18? Or in this case, was ‘Scots’ included as a form of English? Predictably, the census results were difficult to interpret and hence controversial, particularly with regard to Scots. Responses to Q16 relating to ‘skills’ in Scots are summarised in Table 1. The responses to Question 16 showed that 30% of the population claimed that they could speak Scots, just as predicted by the GROS study fifteen years earlier (GROS 1996: 2). However, the announcement of the results by the National Records of Scotland (NRS, the new name of the GROS) cast doubt on the findings by drawing attention to ‘some apparent inconsistencies,’ in particular that ‘a significant number of respondents indicated they were fully skilled in Scots (that is, could understand, speak, read and write Scots) but had no corresponding skills in English—despite then going on to state that they spoke English ‘very well’ or ‘well’ in the following question’ (NRS 2013: 26). McLeod (2013) raises another issue. The number who declared that they could ‘speak, read and write’ Scots was almost five times as many as said they could understand Scots only. This is unexpected as in comparable situations, the number with passive knowledge of a language (understanding only) usually would be similar to or greater than the number with active abilities. That was the finding in the census in Northern Ireland, for example, where similar questions were asked with respect to the local variety, Ulster Scots, and the number of ‘understanders’ was about three times that of those who could speak it.11 Furthermore, given the similarities between English and Scots, ‘it was remarkable that 62% of the Scottish population claimed they had no skills in Scots and could not even understand spoken Scots’ (Macleod 2013) although 98% of respondents said they could speak English ‘well’ or ‘very well’. Unsurprisingly, there are competing explanations for these anomalies. The NRS appears to have tried to issue a pre-emptive caveat, saying in its announcement that ‘research carried out prior to the census suggested that people vary considerably in their interpretation of what is meant by ‘Scots’. It is therefore likely that the census statistics will reflect a very broad definition of the language’ (NRS 2013: 26). This echoes the warning of the pre-census report (Eunson and Murray 2009: 12) that ‘confusion about the meaning of the term […] will lead to inconsistencies in response’. Rather than public understanding of Scots being the problem, they say, the census questionnaire was to blame for much of the confusion. It is ‘the wording and positioning of questions in relation to English, and assumptions being made about it and its relationship to Scots, that need to be carefully examined for any future surveys’ (Scots Language Centre 2013). The same factors, they say, account for another anomalous finding: in response to Question 16, 30% of the population claimed to be able to speak Scots, and 24% to be able to speak, read and write it, but in answer to Question 18, only 1.09% of respondents claimed to use Scots as a ‘language other than English used at home’. The Scots Language Centre suggests that this is due to the context of question 18, which asked specifically about English and ‘other’ languages. Macafee (2017: 4) also suggests an explanation for the large numbers who claimed to have no skills at all in Scots. In some cases, respondents may have under-reported themselves as Scots speakers because they ‘might reserve the label “Scots” for what Aitken (1981, 2015) called “Ideal Scots” […] based on a rural dialect, the speech of an older generation, or a literary model’. Conversely, others, particularly in certain areas, may have taken ‘a liberal view of where the boundary lies on the Scots-English continuum’ and reported themselves as Scots speakers when at least to some listeners they were not (Macafee 2017: 37). In the census in Northern Ireland, three questions were asked—about main language, proficiency in English, and, lastly, ability to understand, speak, read and write Irish and Ulster Scots. The fact that English was not mentioned in this third question may have been a factor in it apparently being better understood than in the Scottish census, where the question also asked about Gaelic and English. It was still possible, in the first question, to declare Ulster Scots as a ‘main language’ though only around 100 people did so; however, 8% of the population said they had some ability in the language in answer to the third question (Northern Ireland Statistics and Research Agency, Table KS210NI). One conclusion which can be drawn from these observations is that the arrangement of questions on the census form has the potential to affect the responses. Clarity of questions and consistency of answers are important goals for census designers. With these questions, there was already potential for variant interpretations of terms like ‘home language’, ‘speak very well’ and, of course, ‘Scots’. To this was added the possibility of variably interpreting the second and third language questions in the context of the preceding ones, as well as potential inferences from the fact that ‘English’, ‘Scottish Gaelic’ and ‘Scots’ were lined up alongside one another in Question 16. Despite the anomalous interpretation of the responses, there is credible evidence for the reliability of the 2011 census statistics. Crucially, the 1996 GROS survey produced the same figure as the census for the proportion of Scots speakers-30%—in the population. Acknowledging the ‘many validity issues’ in the census process, Macafee (2017) nevertheless concludes that the results are reliable. She emphasises that the statistics are internally consistent, stressing that ‘patterns in the data are more to be relied upon than the absolute figures’ (Macafee 2017: 64). One important piece of evidence for reliability is that when responses from different genders are analysed separately according to age, very similar patterns emerge for men and women: a pattern of generally declining use as age decreases, but with sharper falls in the oldest and youngest groups. The lower level among older people is unexpected (Macafee 2017: 43 suggests it may be because this age group tend to know the language as ‘Scotch’ and so did not think they were users) but the same pattern shows itself across most of the geographical regions. Whatever the reason, the consistency across geographical areas suggests that there is a real trend which the census has detected. Other consistent patterns are found in the data too, for example the cities are at lower levels than their surrounding areas, and show a slight rise in the number of Scots users at age 18–19 (2017: 53). Macafee concludes (2017: 64) on the basis of the ‘reassuring similarity’ of the statistics from different areas that ‘as long as we are alert to the validity issues, we have here an extremely valuable set of data’. Table 2 shows the numbers of speakers of Scots, Gaelic and English recorded in Scottish schools from 2008 to 2014. Up to 2010, very small numbers of Scots speakers were reported—approximately half the number of speakers of Gaelic, and far fewer even than the 9834 census respondents aged 3–24 who gave Scots as a ‘language other than English used at home’.16 Over this period, the number of Gaelic speakers declined slightly. There is nothing here that would corroborate the national census figures for Scots speakers. However, the number of reported Scots-speaking pupils increased dramatically in 2011, the year of the census. The six-fold increase in that year cannot be explained by demographic factors such as an increase in the birth rate or in-migration from outside Scotland. It must be attributed either to an increase in the number of pupils or parents declaring Scots as their home language, or to school staff identifying pupils as speakers of Scots where previously they would have reported them as speaking English. In either case, it suggests a sharply increased awareness and acceptance of Scots as a language separate from English. This could reflect changed perceptions in the pupils’ own homes or on the part of their teachers, or both. There was a further almost threefold increase between 2011 and 2014 and further increases since then. While the exact reasons for these figures are difficult to determine, as there were a number of activities around that time that raised the profile of Scots, it seems noteworthy that the year of the census marks the start of the sharp upward trend. Number of home-language speakers of Scots, Gaelic and English in Scottish schools, 2008–2014. In preparation for the 2021 census, the Scottish Government held a consultation in late 2015 to find out, inter alia, what use had been made of the data collected by the 2011 census. Analysis of a selection of the consultation responses suggests that on the whole, public bodies and cultural organisations have accepted the census figures for Scots as valid and potentially useful, while many of the local authorities have expressed doubts about them. For example, South Lanarkshire Council stated that it had ‘serious reservations about the validity of the specification of Scots as a ‘language’’ and doubts about ‘the consistency of the public understanding of what is meant by ‘Scots’’. more limited use was reported in respect of information on the Scots language, where it is used, it has served a number of important purposes […] Respondents told us that in order to be able to monitor the effect of policy initiatives and longer-term trends, it is vital that data on the Scots language continues to be collected in the census. However, other respondents expressed concern about the usability of the data, given known varying interpretations of what is meant by ‘Scots’. NRS currently plans to ask a question about Scots language again in 2021, ‘but will review the detail of the information to be collected in view of concerns around data quality, to ensure it meets user needs in terms of outputs and quality’ (p. 24). The decision to ask census questions about Scots, in a context where (according to the Scottish Government’s 2009 survey) an estimated 64% of the population did not think of it as a language (Scottish Government 2010a: 15), was certain to lead to some difficulties in interpretation of the responses. The one linguistic question which a census might be expected to answer definitively—how many people in a population speak a specific language—has still not been conclusively answered for Scots, because of doubts and discrepancies in the answers. As discussed at the beginning of this paper, censuses are not neutral exercises in enumeration. Kertzer and Arel (2002: 18). point out that ‘the formulation of census questions and categories is inextricably embroiled in politics’. This begins with the decision to enumerate and what to count, whereby certain groups and languages can be ‘nominated into existence’ (Kertzer and Arel 2002: 23, quoting Goldberg 1997: 29), can be denied enumeration, or can reject it. Belgium, for example, decided to stop asking language questions when the answers became ‘politically untenable’ (Arel 2002: 106). Once the census data has been collected, the language categories used in processing the data are likewise the products of ‘underlying language ideologies, and the ways in which a certain view of the world is […] transported and reinforced’ (Busch 2016). The communication of the census findings to users, media and the public is also highly ideological, involving the selection, highlighting and downplaying of information in keeping with the currently preferred official narratives (see Busch 2016; Sebba 2017a). Thus censuses can be seen as instruments for imposing order. Cohn (1996: 8) argues that the Imperial British census operations in India entailed ‘the creation of social categories by which India was ordered for administrative purposes’; hence this enumerative project ‘also objectified social, cultural, and linguistic differences among the peoples of India’. Overall, it can be argued, statistical exercises like the census ‘have become tools in the crafting of modern subjectivity and social reality’ (Urla 1993: 820). The population who are the objects of enumeration, furthermore, may be aware of the effects of censuses and may mobilise in what they feel are their own interests. Cohn (1987: 249-50) observes how in India ‘the consciousness of the significance of the census operation had reached a point where […] some groups set out to influence the answers which people would give in the census’. At an earlier stage, some groups may seek to influence the questions which are asked. Those questions lie at the heart of this ideology-laden exercise. In the Scottish census, the decision to ask questions about Scots—which was not even a language according to many people—was disruptive of the status quo, in which Scots was previously unacknowledged. This decision can be seen as involving a risk not only because it involved asking something new, but because the public understanding of what was being asked was less than robust. In the end, the formulation of the questions—though certainly it was flawed in some ways—may have been less consequential than the simple act of asking about Scots in the national census. The fact of Scots being named on the census form brought it into public view in every home in Scotland, alongside two recognised languages, English and Gaelic. In this way, the social impact of the census can be seen to have gone beyond the collection of data, regardless of whether it was ‘reliable’ or ‘useful’. There are surely lessons here for the sponsors of minority languages elsewhere, especially those that are (or could be viewed as) ‘kin tongues’ of dominant languages. There are many such cases of languages which have not yet been fully ‘nominated into existence’, for example the Italian dialects, the English-lexicon Creoles of the Caribbean, non-standardised varieties of South Asian languages like Sylheti (Bengali) and Bhojpuri (Hindi). Asking census questions about these languages is unlikely to be straightforward: not only will the questions themselves require very careful planning, but the population may need to be informed and educated as well, with differing political positions taken into account. A question raised by Kertzer and Arel (2002: 18ff) is whether the collection of census data on cultural categories can have ‘scientific validity’, i.e. whether there is some objective category which the census could potentially measure if the politics can somehow be separated out (as some statisticians believe), or whether cultural categories cannot in fact be reduced to an objective core. They point out that while identities are social constructions, and hence have no essential reality, people behave as if they were real. These perceived, subjective identities can be enumerated, but first must be named. Citing Urla’s (1993) study as an example, they say: ‘Far from being a scientific enterprise removed from the political fray, the census is more like a political battleground where competing notions of ‘real’ identities, and therefore competing names to assign to categories, battle it out. The prize is a census category which will ‘scientifically’ legitimate the existence of a socially imagined group’ (Kertzer and Arel 2002: 20–21). While the battleground metaphor may be somewhat too dramatic to apply to the Scottish census, it seems clear that one reason for asking about Scots was to legitimate a socially imagined group of ‘speakers of Scots’. While arguably the census failed to enumerate that group unambiguously, it appears to have gone some way to establishing its legitimacy, not only at the state level, but also among the public. This chapter is part of the Dictionary of the Older Scottish Tongue. The authors present this chapter as an introduction for ‘younger or less experienced scholars’ and researchers. Summarised by the Scots Language Centre at http://www.scotslanguage.com/articles/view/id/4752/type/referance [sic] and http://www.scotslanguage.com/articles/view/id/4751. Scottish Parliament, Plenary, 13 Jan 2000. Scottish Parliament, Question S3 W-06377, lodged: 15/11/2007. The title of the website is a play on the expression ‘I can’. Aye([/aɪ/]) is a Scots word for ‘yes’. ‘Aye can… Speak Scots’, http://www.ayecan.com/listen_to_scots.html accessed 18th June 2018. (Note that the audio clips are no longer accessible). Scottish Parliament. Draft Census (Scotland) Order: Follow-Up To Discussion By Economy, Energy And Tourism Committee, 10 March 2010. Retrieved on 06.06.2016 from http://archive.scottish.parliament.uk/s3/committees/eet/inquiries/Census/COFFollowupofEETCommitteetoISfromJMevidenceformatted.pdf. In England, where the question about ability in English was asked only of those who did not claim English as a ‘main language’, 1586 wrote in that their main language was Scots, and 150 of these—almost 10%—said they spoke English ‘not well’ or ‘not at all’. The overall ratio of understanders to speakers was approximately 2:1. See Table KS210NI Knowledge of Ulster-Scots, Northern Ireland Statistics and Research Agency. Response 288088306, retrieved on 01/06/2016 from https://consult.scotland.gov.uk/national-records-of-scotland-survey/scotlands-census-2021-topic-consultation/consultation/published_select_respondent. Caroline Macafee, personal communication, 06.06.2016. Q16 also asked explicitly about Gaelic skills, while in Q18 there was an opportunity to write it in as a ‘home language’. For Scots, only 4% of those who said they could speak Scots in Q16 claimed to use it at home in Q18. The equivalent percentage for Gaelic was 43%. See Table KS206SC—Language All people aged 3 and over. School/Pupil Census: Data Specification 2011 Uplift, supplied courtesy of ScotXed Unit, Education Analytical Services, Scottish Government. Table LC2119SC—Language other than English used at home by age. For comparison, the national census recorded 16,129 Polish speakers aged 3-24, while the pupil census recorded 7054 (46% of the former) in 2011. Other home languages were not individually reported. I am very grateful to Caroline Macafee for comments on earlier drafts and for her most helpful suggestions of relevant literature, as well as to the anonymous reviewers of this paper. Any mistakes or misunderstandings in this paper are, of course, mine. Aitken, A. J. (Ed.) Caroline Macafee 2015. ‘Collected Writings on the Scots Language’, Scots Language Centre [online]. Retrieved July 8, 2016 from http://www.scotslanguage.com/aitken-papers. Busch, B. (2016). Categorizing languages and speakers: Why linguists should mistrust census data and statistics. In Working papers in urban language and literacies paper 189. London: Kings College London. Retrieved July 5, 2016 from https://www.academia.edu/20770728/WP189_Busch_2016._Categorizing_languages_and_speakers_Why_linguists_should_mistrust_census_data_and_statistics. Douglas, F. (2009). Scottish newspapers, language and identity. Edinburgh: Edinburgh University Press. Retrieved August 13, 2018. from http://www.jstor.org/stable/10.3366/j.ctt1r27w4. Macafee, C. (2017). Scots in the census: Validity and reliability. In M. R. McColl (Ed.) Before the storm: Papers from the Forum for Research on the Languages of Scotland and Ulster triennial meeting, Ayr 2015 (pp. 33–67). Aberdeen: Forum for Research on the Languages of Scotland and Ireland. Retrieved July 24, 2017 from https://www.abdn.ac.uk/pfrlsu/volumes/vol5-before-the-storm/. Macafee, C., & Aitken, A. J. (2002). History of Scots to 1700 by Caroline Macafee, incorporating material by the late A. J. Aitken. In: The Dictionary of the Scots Language Retrieved June 30, 2016 from http://www.dsl.ac.uk/about-scots/history-of-scots/. Mackinnon, K. (1990). A century on the census—Gaelic in Twentieth Century Focus. Retrieved May 24, 2016 from http://www.arts.gla.ac.uk/STELLA/STARN/lang/GAELIC/focus.htm. Macleod, W. (2013). Gaelic Scots and other languages. In Bella Caledonia (online publication). Retrieved October 3, 2013 http://bellacaledonia.org.uk/2013/10/03/gaelic-scots-and-other-languages/. NRS (National Records of Scotland) (2013). 2011 Census: Key results on population, ethnicity, Identity, language, religion, health, housing and accommodation in Scotland—Release 2A. National Records of Scotland, Edinburgh. Retrieved from http://www.scotlandscensus.gov.uk/documents/censusresults/release2a/StatsBulletin2A.pdf. Accessed 15 Aug 2018. NRS (National Records of Scotland) (2016). Scotland’s Census 2021—Topic consultation report. Retrieved from http://www.scotlandscensus.gov.uk/documents/census2021/Scotlands_Census_2021_Topic_Consultation_Report_August_2016.pdf. Accessed 15 Aug 2018. Scots Language Centre (2010). Census Landmark for Scots (press release), Retrieved April 29, 2010 from http://scots-toun.co.uk/news/May-2010/Census_Landmark_for_Scots. Scots Language Centre (2013). Brief Analysis of the 2011 Census Results. Retrieved from http://media.scotslanguage.com/library/document/SLC%20Analysis%20of%20Census%202011%20for%20Scots.pdf. Accessed 15 Aug 2018. Scottish Government (2010a). Public attitudes towards the Scots Language. Scottish Government Social Research. http://www.gov.scot/Resource/Doc/298037/0092859.pdf. Accessed 15 Aug 2018. Scottish Government. (2010b). Scottish Parliament, Economy, Energy and Tourism Committee. Official Report 10 March 2010. Retrieved September 30, 2016 from http://archive.scottish.parliament.uk/s3/committees/eet/or-10/ee10-0902.htm. Accessed 15 Aug 2018.